Photoshop: How do I create a saturation mask? I'd like to perform an operation to perform "curves" effect on the saturation of image. Curves can already work on Red, Green, Blue, or RGB. This would be an effect that converts the RGB to HSB, and applies the "Curves" effect to only the "S" while leaving the H and B unchanged for each pixel. 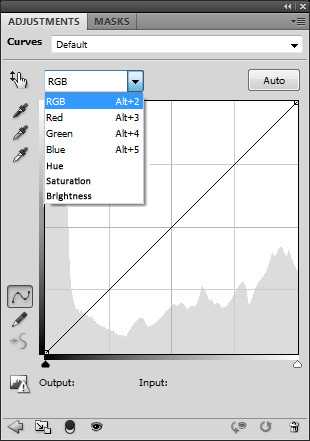 Basically curves to change saturation in the Hue Saturation adjustment? Do you need to control it per hue, per saturation, or both? There are various places where you could implement this, and various extents to which you could choose a more or less robust implementation. The feature that compelled me to ask for this feature would simply be a "saturation" option for the Curves adjustment. Having additional options to effect hue and brightness in the same way would be nice too, but not as important as saturation for me. Adjustments for HSB would also be perfectly well suited to being added to the "levels" adjustment, and one could envision a version of this idea where "curves" manipulators could optionally replace the sliders in the Hue Saturation adjustment. My preference would be to have HSB options for the Curves adjustment, but any of the above solutions would be great. Ok, so that would just map saturation to saturation (and wouldn't be great in curves because of precision loss, bad UI match, etc.). LinoColor had a saturation curve dating back a good 8-10 years. I suspect this is the geniuses of the request. FWIW, it worked quite well and for some images, was kind of useful because you could as an example, lower saturation in shadows. You can do that today with channels (generated from a CMYK iteration, using the black channel) but its a lengthy process. Actually, my ideal solution, but which I didn't mention because I figured it would be more difficult to implement would be to be able to get the saturation as a mask. That way, I could do whatever I wanted with it. Creating a mask is actually easier than any of the previous suggestions, but it doesn't accomplish the same thing you were previously talking about. Well, if I took that saturation channel, and used it as a mask for a Hue and Saturation adjustment layer, then I'd be able to get a pretty similar effect to what the Saturation Curves would grant me. i.e. the ability to increase saturation on the most saturate parts of an image while simultaneously decreasing saturation on the less saturation parts of the image (via inverting the mask with a separate hue_saturation adjustment). The inspiration for this feature was in comparing an image viewed on my Cintiq .vs an image displayed on an iPhone. I tinkered with monitor calibration and color settings for a while, but the problem was more complex than any of the settings available could help me solve. The problem was not a simple as one being brighter or an overall difference in saturation or contrast... The hue was not skewed. The problem was more complex. colors that are close together get closer together. Numbers that are far apart get further apart. Not only was this effect very difficult to reproduce in Photoshop, but it was very cool looking. I figured, it might be handy tool to have around all of the time. After all, I can get the image brightness independent of the hue and saturation... I can get the hue independent of the saturation and brightness. Why can't I get the saturation independent of the brightness and hue? But the above system is flawed since hue affects brightness, and different colors of the same saturation can have different brightness depending on the hue. So, as far as I can tell, there is no way to accurately get the saturation levels independently of the color and brightness within Photoshop. OK, that helps clarify what you're after much better. Thank you. Yeah, using the HSBHSL plugin to get a mask is currently the only easy way to do that. You can also use channel math and/or blend modes, but it'll take a lot more steps. That HSBHSL plugin get's the job done just fine. Set up a photoshop action to create a new file, make the conversion, grab the saturation, and copy it back into the original image. For each color channel drive the black slider all the way left. For each Neutral (White, Black, Gray) drive the black slider right. Make a mask from one of the channels, then delete the Sel Col layer. By saving this setting it's very quick to add the adj layer, choose the preset from the pull down menu and you're there. A hot key action would be even faster. Oh man, this is exactly what I've always needed. I've tried so many other solutions, but yours was the best so far, thanks! Are you sure the Selective Color Adjustment Layer produces the right result? It doesn't match any other method like using the HSB/HSL filter in photoshop or photoshop 1 where there was actually HSB and HSL Color Modes or Gimp. I still like the feature request for saturation curves, even if he has a workaround for now. I still like that idea too. I can basically make the adjustments I was looking for with Chris's plugin, but the curves would be great. FWIW, have you tried messing with a curves adjustment layer set to saturation blend mode? Go in to the individual curves channels and play around, it's fun. 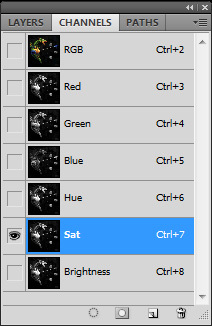 I would like to be able to select saturation only (now you can only select light/dark areas or areas belonging to a specific color). Such Photoshop feature woud enable us to make a mask according to saturation and thus apply effects gradually according to the level of saturation (like, for example, sharpening only the least saturated areas). Select saturation only (and not lightness/darkness or just a color). Scott Mahn's answer worked for me. Actually today many Luminosity Mask panels offer Saturation Mask as well. NBP Lumizone (General Luminosity / Saturation Mask Plug In). The NBP Lumizone has a nicely done video on Saturation Mask - NBP Lumizone for Photoshop | Saturation Masking.